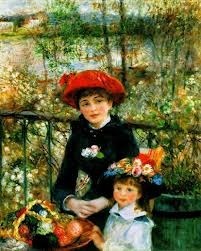 Were the Impressionists fashionistas? And what role did fashion play in their goal to paint modern life with a “modern” style? This is the subject of the internationally acclaimed exhibition Impressionism, Fashion, and Modernity, the first to uncover the fascinating relationship between art and fashion from the mid-1860s through mid-1880s as Paris became the style capital of the world. Featuring 75 major figure paintings by Caillebotte, Degas, Manet, Monet, Renoir, and Seurat, including many never before seen in North America, this stylish show presents a new perspective on the Impressionists—revealing how these early avant-garde artists embraced fashion trends as they sought to capture modern life on canvas. Impressionism, Fashion, and Modernity is organized by the Art Institute of Chicago in association with the Metropolitan Museum of Art, New York, and Musée d’Orsay, Paris. If you go to Chicago, do not miss this. It should be magnificent. I saw this last week, and it was wonderful! I recommend giving yourself plenty of time to examine everything. We were rushed out by the museum closing, and I would have preferred another hour to take it all in. Wait!! This class is in Chicago, IL, which we think is kinda far away from .